I came up with this mood board because I'm redecorating in my Master Bedroom (again!) 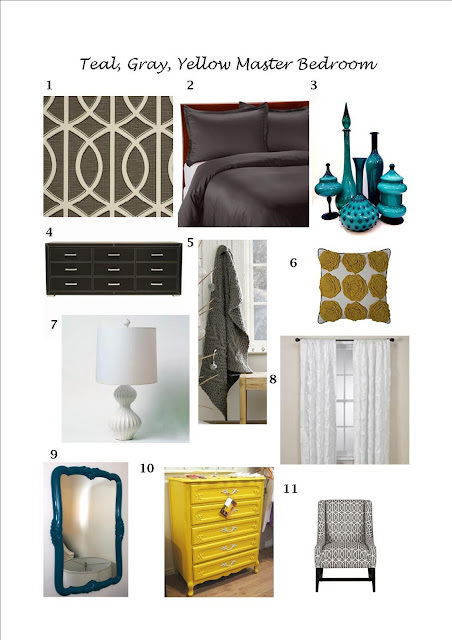 Because I just created a headboard and purchased Dwell Studio's Charcoal Gray fabric for it, I wanted to create a little inspiration board to complete the room. I already own a black long modern dresser, Vintage Yellow Chest of Drawers, teal glass collection, white lamp, white Nicole Miller Chateau curtains, and the teal mirror. To complete the look, I'll need to invest in a Gray Duvet cover or a Gray comforter and either a teal or Gray throw blanket. Joe says I need to wait until my birthday. Maybe I can convince him of the romance of it and ask for it on Valentine's Day? ;) Joe hope you're reading this.